By the mid-’80s, Vespa was facing numerous challenges to its future in the scooter making business. In the United States, California had passed strict air quality regulations that prevented the sale of Vespa’s oil-burning 2-stroke models, contributing to the company’s withdrawal from North America in 1981. Globally, though Vespa was still producing scooters and had some very successful models, they were losing market share to the more modern Japanese makes. In fact, scooter sales were booming, but it was Honda at the forefront. Their Elites and Helixes, as well as Yamaha’s Riva and other models at the time helped define the style of the decade, while Vespa was firmly rooted in the past. 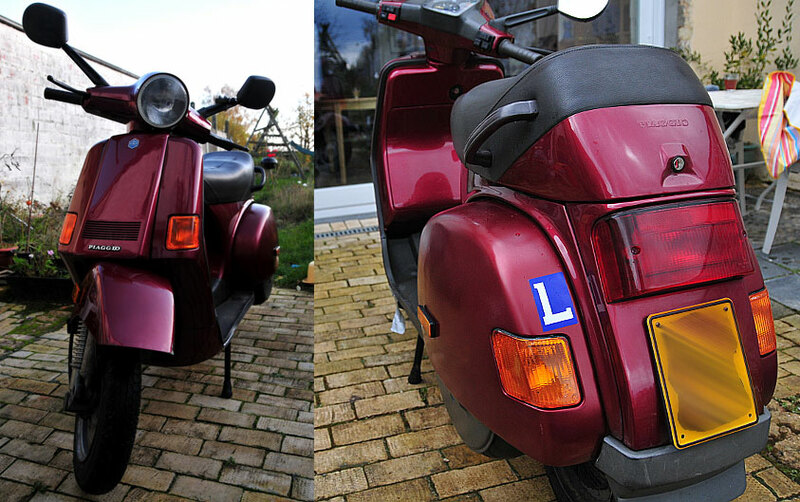 Vespa’s parent company, Piaggio, was aware that buyers’ tastes and expectations were changing. Though the form of their models had changed from the graceful curves of the ’40s through the ’60s to the bulkier large frames of the ’70s, the underlying technologies and mechanics had scarcely evolved in over 30 years. The ’80s zeitgeist and aesthetic focused on technology and the future, not nostalgia and the past. Looking for radical solutions, the company turned to famed industrial designer Paolo Martin. Martin came with a serious resume, having started at Bertone before becoming the styling chief at Pininfarina, then De Tomaso/Ghia — the automotive equivalent of going from Prada to Gucci to Bulgari. He had designed the popular Fiat 130 Coupé and one of the most controversial concepts in automotive history, the super-futuristic (for 1970), wedge-shaped Ferrari 512 S Modulo. The most striking effort from Martin was the Vespa H2O 200 (1984). A severe departure from the Vespa styles of the time, the H2O’s curved bodywork was beyond even what Honda and Yamaha were producing at the time. 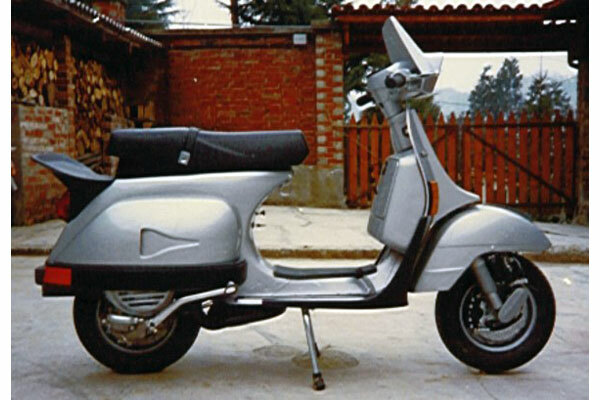 (The Lambretta-like elongated front fender is very similar to what would appear on the 1985 Yamaha Riva.) Even bigger changes would lie beneath the cowls: The H2O was to feature a water-cooled 4-stroke 200cc engine. And, possibly, an automatic CVT transmission. Though undoubtably of the ’80s, the H2O has hints of Vespa’s future. The convex legshield and curved, tapered cowls defined the look of the ET series, which didn’t debut until 2001. The rear lights and signals, flush with surrounding surfaces, even suggest the iconic Apple iMac and iPod designs. Martin later took the H2O and combined it with the styles of existing PX and T5 models to create the 1988 Cosa, which sported more flat and beveled surfaces, squared-off cowls, a jutting horncast, and a round headlight. An oft-criticized collection of compromises, the Cosa took the H2O style one giant step backwards, in a direction the company would eventually abandon. 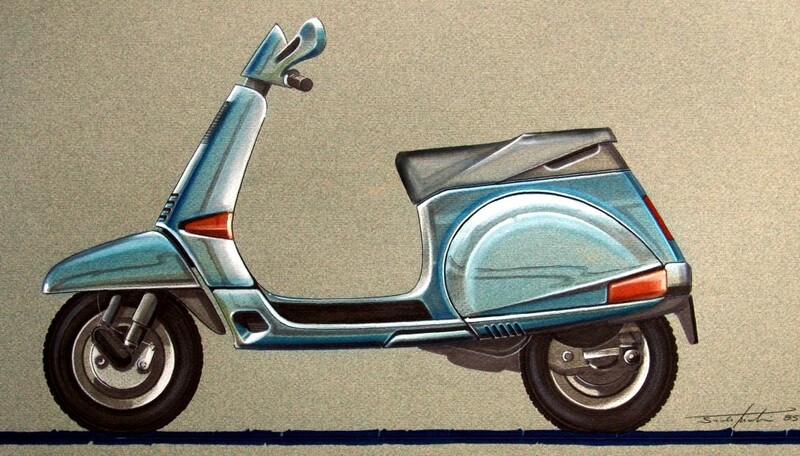 Martin’s concept drawing for the Vespa Cosa. The Cosa didn’t have a water-cooled 4-stroke engine (which wouldn’t appear in a Vespa until 2003’s GT series), but it did have some new technologies for the brand, including dual hydraulic brakes. It remains the only Vepsa to feature an antilock braking system — at least until the 946 hits the market later this year. Martin also sought to update the existing Vespa line. Less ambitious than the H2O, the Sport 200 was intended as a variant to the PX series, similar to the current LXS and GTS Sport versions. The design is far less focused, with oddly-shaped vents on the cowls and a rear spoiler as absurd as it is large and unnecessary. Paolo Martin’s Vespa Sport 200 concept (1984). Martin’s website is a treasure trove of ideas the point to a very different Piaggio/Vespa future than the one that we’ve seen develop over the past 30 years. These include a 16″-wheel scooter (1984), a small scooter that looks more like a household appliance than the Yamaha C3 (1985), and the “Maxi,” a fully canopied scooter that predates the 2000 BMW C1 by 15 years. Also among these are two Vespa microcars from the early ’70s — one a three wheeler — an idea they’ve flirted with many times since discontinuing the Vespa 400 in 1961. Scooter Cannonball 2014: Crazy and Rarin’ to Go!